In order to know if you are in this case, you can check whether the ticket mentions “Contrôle automatisé” in the frame “Vous contestez avoir commis l’infraction”. If you are in this case, the whole process can be done online via antai.gouv.fr. We recommend you to do the whole process online. However, if you prefer to do it via mail, be aware that you have to send a “Courrier Recommandé avec Accusé de Réception” (which costs around 6€). 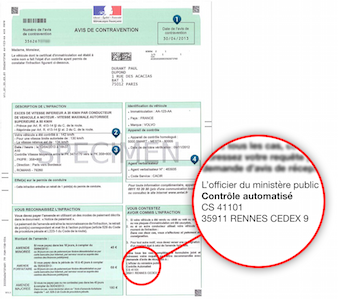 Exemption requests can be made even after receiving an increased fines notice (“avis de majoration”). No increased fines will be charged (neither to you nor to the driver). However, we recommend you to process to the exemption request as soon as possible. Whatever the ticket is, you must report the driver by following the instructions for the driver's identification process detailed in the infraction (you receive them along with the fine notification). Contact us if you have questions on how to do it. In Germany, the car owner is not in principle liable for an infraction which was committed by another driver (so-called “driver responsibility”): if the driver violates the traffic safety (e.g. speeding, crossing red traffic lights), you will receive a letter in the course of the relevant infraction. First, you will be sent a reply form whereupon the fine notice follows. From then on you have 14 days to contest the traffic ticket. It may also happen that the authorities already are aware of the fact that you as the car owner were not the responsible for the infraction. In this case, you will receive a witness questionnaire. Once you have been sent the penalty notice, you normally have several possibilities to contact the according authorities. Many fines offices offer you a online service free of charge to react to the traffic ticket. You will then need to use the login data specified in the reply form or the witness questionnaire. If this is not the case, please fill in the reply form with the drivers’ information and send it back to the authorities, which sent you the letter in the first place. The authorities will then check whether the exemption request was made properly and then passes the fine notice on to the driver. You can also send a fax to the authorities to declare your contestation. You will find the corresponding fax number in the fine notice. For any country, you must follow the instructions on the ticket to contest the ticket and nominate the driver. Depending on the countries, it is sometimes possible to do the whole process online (which we recommend). In other cases you’ll have to reply via simple mail. Exception for dutch tickets : Because the Netherlands don’t (yet) allow car rental between individuals, it is impossible to nominate a different driver. You will have to pay the fine yourself and advance the costs. You can then send us a copy of the payment receipt, the payment receipt and the paper agreement (unless you used the mobile agreement) through our contact page. We will do our best to pay you back in the shortest possible delay, and will then charge the driver for the fine. Dutch tickets never include points loss.